WHY SHOULD I CHOOSE A CERTIFIED CIVIL TRIAL ATTORNEY? To be one of the approximately 80,000 attorneys licensed to practice law in New Jersey, a person must graduate law school and pass the New Jersey Bar Exam. But in order to become a Certified Civil Trial Attorney, an attorney must do more. An attorney granted Certification must pass an additional examination, have been favorably evaluated by judges and attorneys familiar with their work, and must have demonstrated a “substantial” level of experience in trial law. Less than 2% of attorneys licensed to practice in New Jersey have the honor of this certification enabling them to say they have met the objective and rigorous standards approved by the U.S. Supreme Court and the American Bar Association. 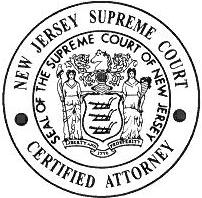 Stephen Barry is certified by the Supreme Court of New Jersey as Civil Trial Attorney; and Joseph Grassi is certified by the Supreme Court of New Jersey as both a Civil Trial Attorney and Criminal Trial Attorney.